Just installed Vbar NEO and I have to say it works great, added the Pro-Rescue feature and it also works great, it's amazing at the things you will try in the air with that little added security blanket. Would highly recommend this newest product from Mikado to anybody. Since I have converted my Vbar setups to the control transmitter, I was really happy with one notable exception. With certain servos, I could cause the Vbars to brownout/reset. That was not acceptable and I had to find an alternate solution. To use the old style Vbar, I had to go to a dedicated BEC that had split power buses. The new Neo doesn't require that to make these servos work reliably. I see no evidence of it browning out or shutting down. Thanks, Mikado. Setup is just like the other Vbars now that I am using the Vbar control and works great. Love This thing also with the rescue and Pro no more plugging into the laptop!! I highly recommend adding the Pro Upgrade!! 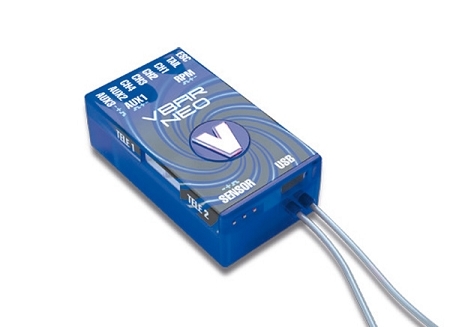 I am very satisfied with the new VBar Neo Vlink. It is everything you can expect from Mikado. I like the new combined receiver and control unit making a clean installation specifically when you mount the Neo at the rear of your model allowing the antennas to be mounted onto the boom with the new antenna clamp. Also the new 6.1 control loop does what they promised -The violent ballonig effect on the edge at high speed is almost gone! I love the form factor of the NEO, it's very compact and easy to install. Perhaps the only thing I would wish for is slightly longer antenna wires. It flies great (like any VBar) and I look forward to many happy flights.